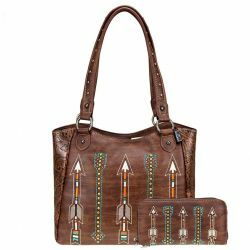 Montana West Handbag And Zipper Wallet Set With Arrow Embroidered design. 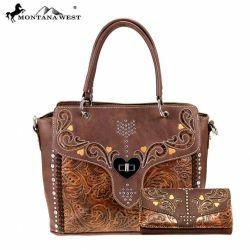 Montana West Handbag And Bi-Fold Wallet Set With Embroidered Heart Design. 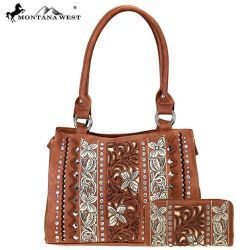 Montana West Handbag And Zipper Wallet Set With Floral Embroidery. 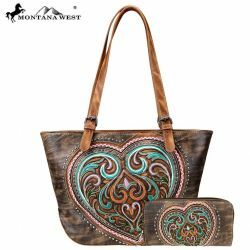 Montana West Handbag And Zipper Wallet Set With Embroidered Heart Design. 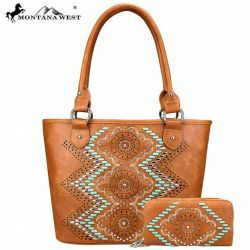 Montana West ® Light Brown handbag and zipper wallet set with turquoise leather lacing and tribal pattern. 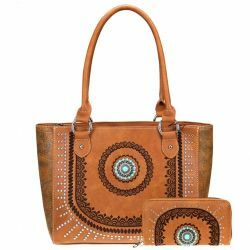 Montana West Conceal Carry Handbag and Matching Wallet Set with embroidery and turquoise concho. 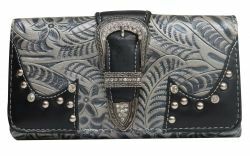 Silver embossed PU leather wallet with rhinestone western buckle. Black PU leather billfold wallet. 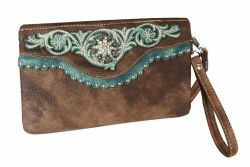 Accented with turquoise and cream embroidery and silver studs. Black PU leather zipper wallet with cutout cowhide cross. 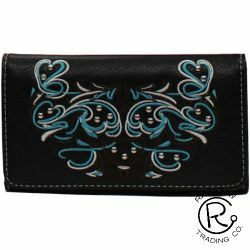 Black PU leather messenger wallet with floral embroidery. 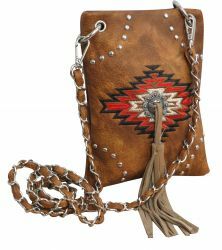 Brown PU leather zipper wallet with cowhide cross. 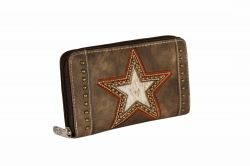 Brown PU leather messenger wallet with cut out cowhide star. 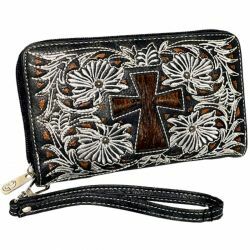 Black PU leather zipper wallet with cross concho. 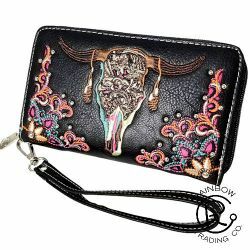 Black PU leather zipper wallet with boho cow skull. 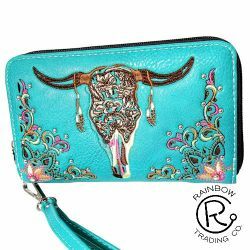 Turquoise PU leather zipper wallet with boho cow skull. 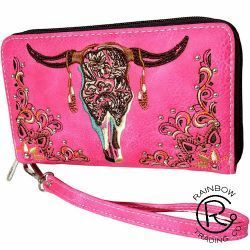 Pink PU leather zipper wallet with boho cow skull. 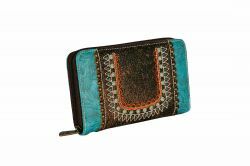 Embossed Turquoise PU leather zipper wallet. Measures 8" x 4.5". 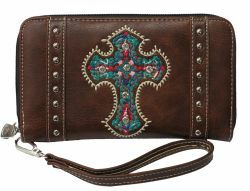 Brown PU leather zipper wallet with embroidered cross design. Brown PU leather messenger bag with chain strap. 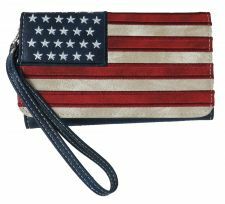 Blue PU leather phone wallet with American flag design. 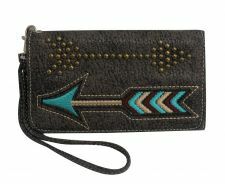 Dark PU leather phone wallet with embroidered and studded arrow design. 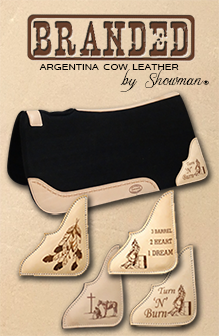 Brown PU leather messenger bag style wallet with embroidered steer skull design. 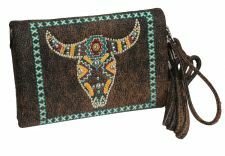 Brown PU leather messenger bag style wallet with embroidered design and crystal rhinestone concho. 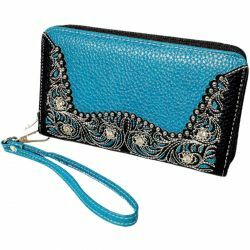 Turquoise PU leather zipper wallet with black floral embroidery. 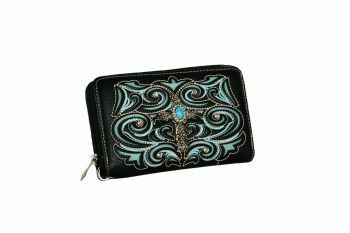 Black PU leather zipper wallet with embossed turquoise leather overlay.